the skin, hair, health & body; the health and beauty benefits are staggering. Visual artistes in the China Tang Dynasty when applying stage makeup used Pearl Powder to beautify and protect their skin. Empress Dowage, who was a powerful and charismatic woman, unofficially but effectively controlled the Manchu Qing Dynasty in China for 47 years took Pearl Powder Internally as well as using it externally. And Wu Ze Tian also used Pearl Powder internally and externally and her skin was said to be as beautiful and radiant as younger women. Pearl has other interesting applications. In China, pearl powder is used to heal wounds because of its antiseptic properties. In the United States, surgeons frequently sprinkle a lower-grade pearl powder, called surgical pearl, into their latex gloves before operating. The soothing, antiseptic pearl powder absorbs excess moisture and may help prevent the spread of infection. Traditional Chinese medicine (TCM) uses the medicinal qualities of ingested powdered pearl to treat inflammatory illnesses including epilepsy, convulsions, hyperactivity, hypertension, insomnia and palpitations. Pearl powder sprinkled into shoes helps absorb odor and excess moisture. Pearl has been used to treat ulcerous sores by sprinkling the sores with the powder. 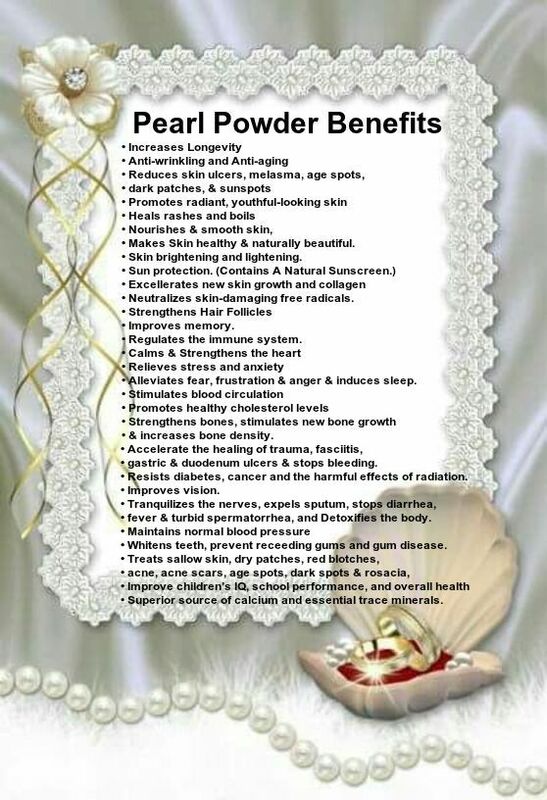 Pearl will keep you young looking and healthy throughout your aging years.